On the northeast corner of S. Walter Reed and S. Four Mile Run Drives is the only remaining patch of woodland on the north side of the Four Mile Run stream valley in the Shirlington area. This woodland remnant has some of the same steep topography, underlying geology and hydrology (perched seeps), and plants as Barcroft Park, which is located on the opposite side of the valley. Restoration site along S. Four Mile Run Drive at S. Walter Reed Drive. Photo from Google Map. Recently, Arlington County proposed to develop its part of the woodland. This proposal was opposed by a number of individuals, groups, and organizations that value the woods, so little of which is left. Nora Palmatier of the Tree Stewards made a commitment to initiate a cleanup of these woods––invaded by all the usual suspects (English Ivy, Japanese Honeysuckle, Bush Honeysuckle, Porcelainberry, etc. )––if the site were left undeveloped. (Thank you, Nora!) The County pulled back from its proposal just last week. 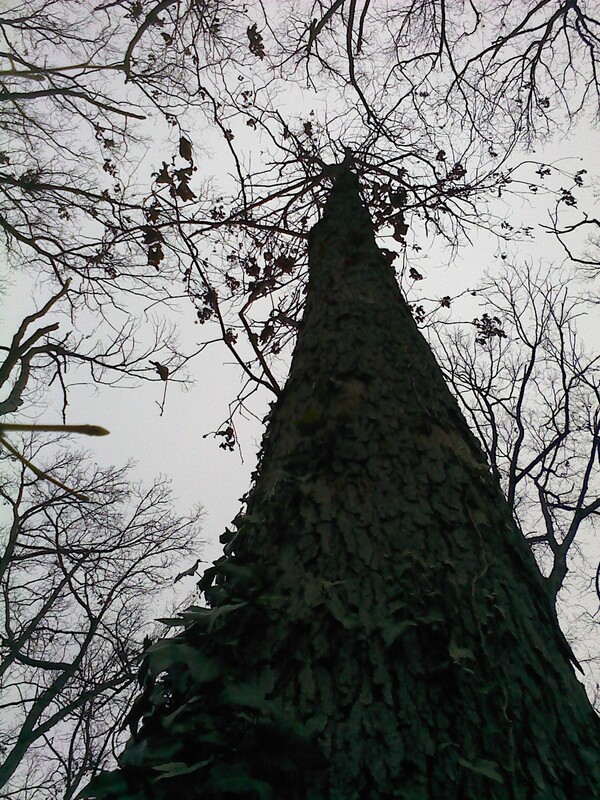 This Saturday, April 5, from 1:00 to 3:00 p.m., Arlington/Alexandria Tree Stewards, Master Naturalists, and residents of neighboring condominium associations will begin the promised restoration work. Arlington County Parks will provide trash bags for the debris. The public is welcome to join in this effort. 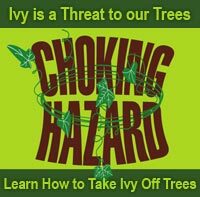 We recommend that volunteers wear long sleeves, long pants, and gloves, and bring hand clippers and/or pruning saws to cut ivy and other invasive vines from the trees. See you there! 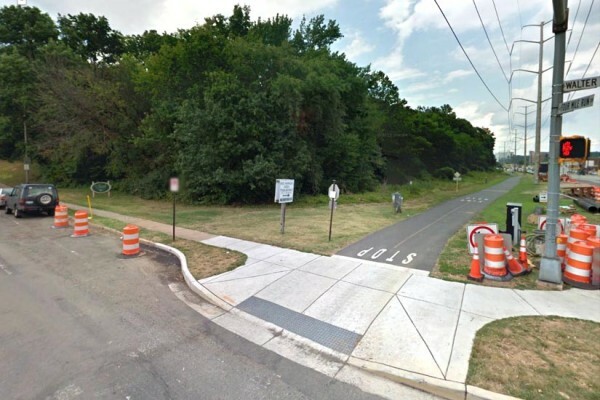 Join our friends from the City of Falls Church on Sunday, March 30, 10 am-12 noon, as they begin work to restore the natural area along the W&OD Trail between Grove Ave. and N. Oak St., only a block from where the trail crosses the bridge over Broad St. There are large thickets of Porcelainberry and other invasive vines along the bike path, which in its current state serves as an effective migration route for these plants up and down the trail, and into many of our parks arrayed along Four Mile Run. 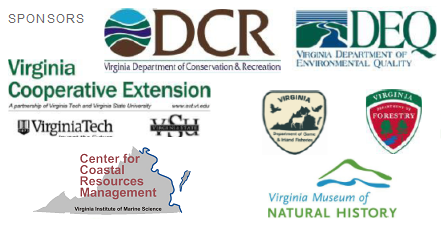 In a trailblazing cooperative effort among the City of Falls Church Environmental Council Habitat Restoration Team, the Northern Virginia Regional Parks Authority, Dominion Power, volunteers, and naturalists, the invasive plants will be removed and the area landscaped with native plants and butterfly gardens. 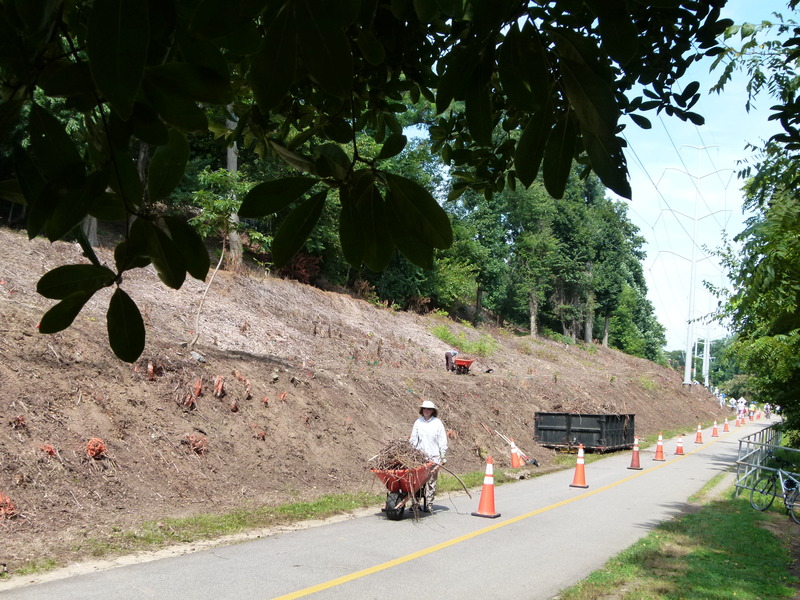 Similar work is already underway along the W&OD in Arlington at Bluemont Park with some 200 yards of invasives cleared last fall, preparing the way for a native meadow. Eventually, we’ll connect these two dots, and the three miles in between! Organizers will provide tools and snacks. Please bring your own gloves. 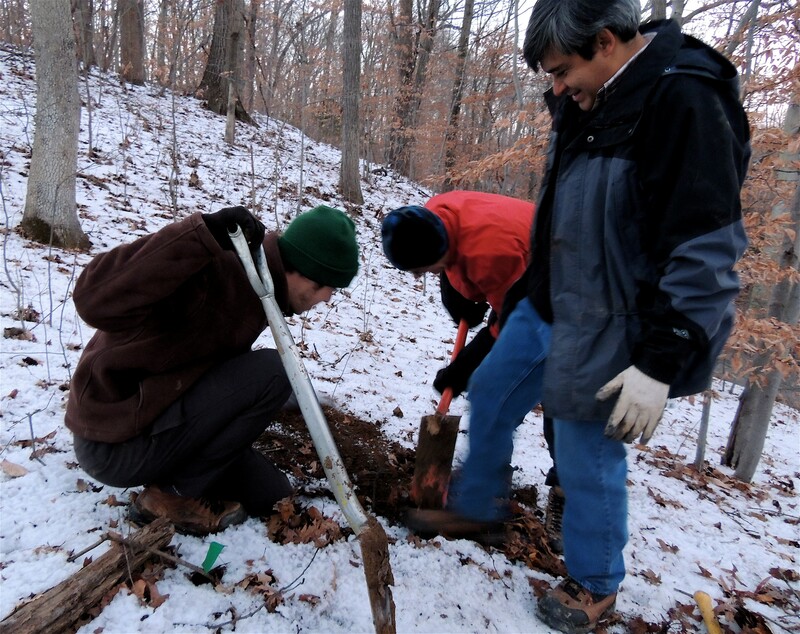 As the late afternoon light began to fade and frigid air penetrated gloved hands, the last of the Arlington replanted American Chestnut trees (Castanea dentata) was patted into place on a slope in Glencarlyn Park on a gray day in mid-December, 2013. There, with some serious luck, it could grow into a sturdy tree with viable fruit and possibly help reverse the bad fortune of the iconic American Chestnut––once one of the most common tree species in the northeastern United States, but now largely decimated due to a virulent fungus. 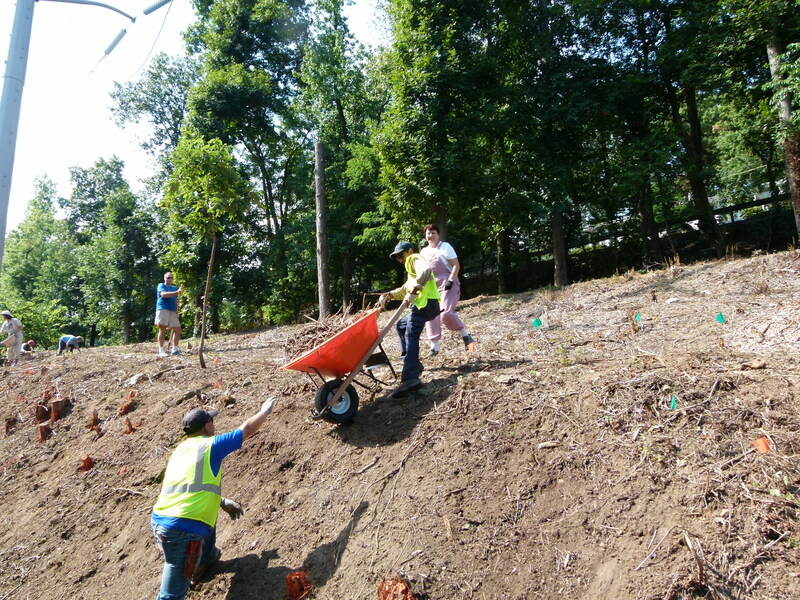 Arlington County Forester Vincent Verweij and ARMN volunteer Jerry Cowden backfill the last hole of the day on a slope in Glencarlyn Park, while County Natural Resources Manager Alonso Abugattas tamps down the soil. Chestnut Blight Fungus (Cryphonectria parasitica) was introduced into North America through Japanese or Chinese Chestnuts; those species co-evolved with the fungus and are not affected by it. American Chestnuts, however, soon succumbed to the novel pathogen. More than three billion native chestnuts perished, removing a species that was a valuable source of timber and a prolific native producer of fall mast for wildlife. HOG Pull is a continuing project on the first Saturday of each month to reclaim the natural area between Haley Park, Oakridge Elementary School, Gunston Middle School from Invasive Plants. It is a RiP (Remove Invasive Plants) and ARMN approved project. 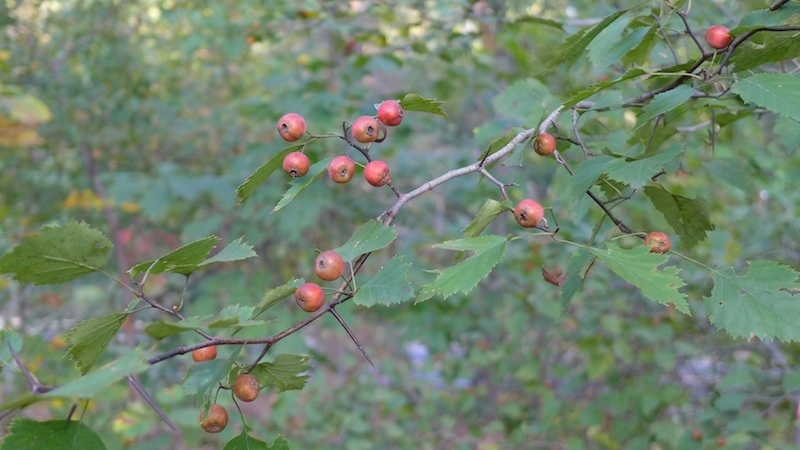 The locally rare frosted, or waxyfruit hawthorn (Crataegus pruinosa) is bearing abundant fruit this season at HOG woods. Appropriate clothing, including good footware. Some parts of the area are steep and contain poison ivy. We will provide extra gloves and tools. July 2013: Dangerous Plants on the Run! You may have seen the warning signs “Don’t walk off the trail.” Plant specialist placed them to protect pets and people. 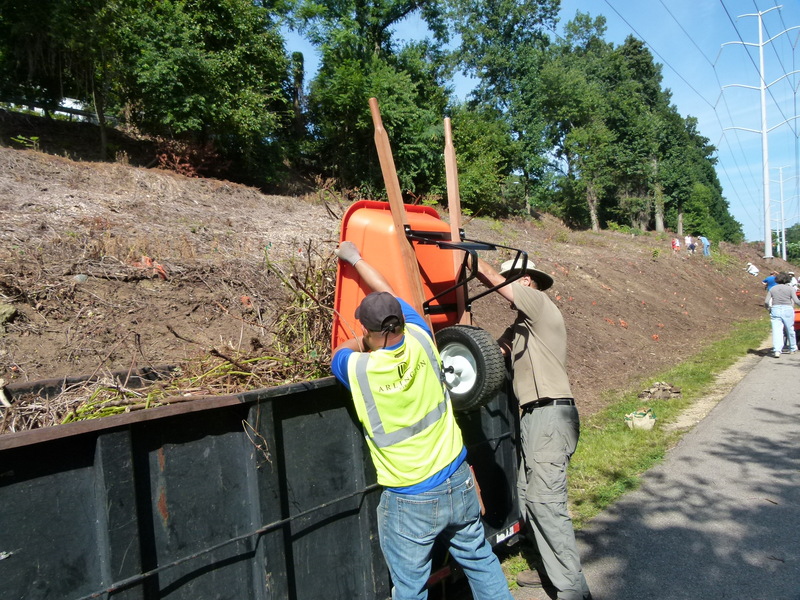 Arlington County hired Invasive Plant Control (IPC) to help improve Tuckahoe’s habitat. IPC employees are specially licensed and trained. Only the most environmentally suitable chemical, a glyphosate-based herbicide, was used on non-native plant species. A sturdy crew of four bush-wacked throughout Tuckahoe Park, giving no ground to the plants harming Tuckahoe’s habitat. The dead, brown-leaved plants indicate plants killed by the treatment. Norway maple, Asian bittersweet, Winter creeper, English ivy, Japanese holly, Prunus avium, Prunus subhirtella, Golden Rain tree, Malus spp., California privet, Chinese barberry, Callery pear (Bradford pear), White mulberry, Amur bush honeysuckle, and Multiflora rose. Please contact Sarah Archer, Arlington County Invasive Removal Coordinator. August 2013: Natives are back! The “Grow Zone,” replanted with natives by Eagle Scout, Jacob Heidig, has flowers in bloom. 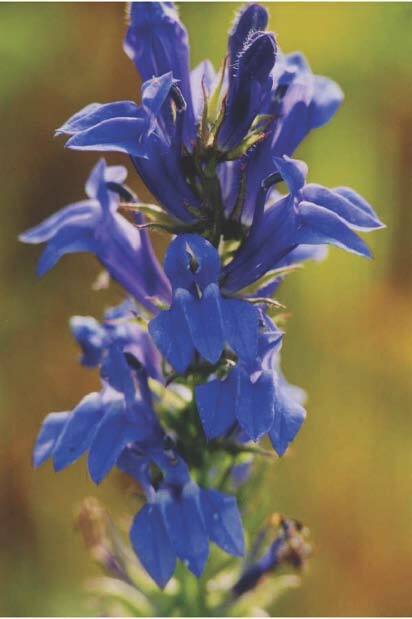 Rare native Smartweed, Great Blue Lobelia, Cardinal Flower, orchid Joe-Pye, fucia Bergamot, Ox Eye Sunflower, and purple New England Aster. Join us on September 21 from 1 – 3 pm for the next Barcroft Park Habitat Restoration Work Party. We will join with Arlington for a Clean Environment (ACE) to help lead volunteers in cleaning up trash in the park. There are over 55 volunteers already signed up with ACE so leaders are really needed to help direct the volunteers. The ACE team will focus on the stream and we will lead teams on the trails and other areas in the park. We will meet at the picnic pavilion in Barcroft Park at 1 pm. If you park in the Barcroft recreational area parking lot, walk past the soccer fields, bear right and then cross the stream on the wood and steel bridge. Wear long pants and long sleeves. Bring gloves if you have them. We will also supply gloves and garbage bags for trash pick-up. In order to help ACE plan for supplies and snacks, please register at the ACE site (https://www.eventbrite.com/event/7582711093) as an ARMN volunteer. This is a wonderful opportunity to see the results of the work done so far in Barcroft Park, and observe a park on its way to natural health. If you have worked with us in the past, come see the results of your hard work and the significant investment by Arlington County. If you are new to Barcroft, join us to see the park that has been designated as a top priority for Arlington due to its unique habitat. After the work party, we will provide a short update on the results of Arlington County’s continuing work to treat invasives and improve habitat as well as describe longer term plans for meadow habitat. This project needs you! Every pair of hands makes a difference for this valuable ecological site. Your work will help improve the habitat for birds and other wildlife in Barcroft. If you have questions, please contact Marion Jordan at mcjordn@verizon.net. 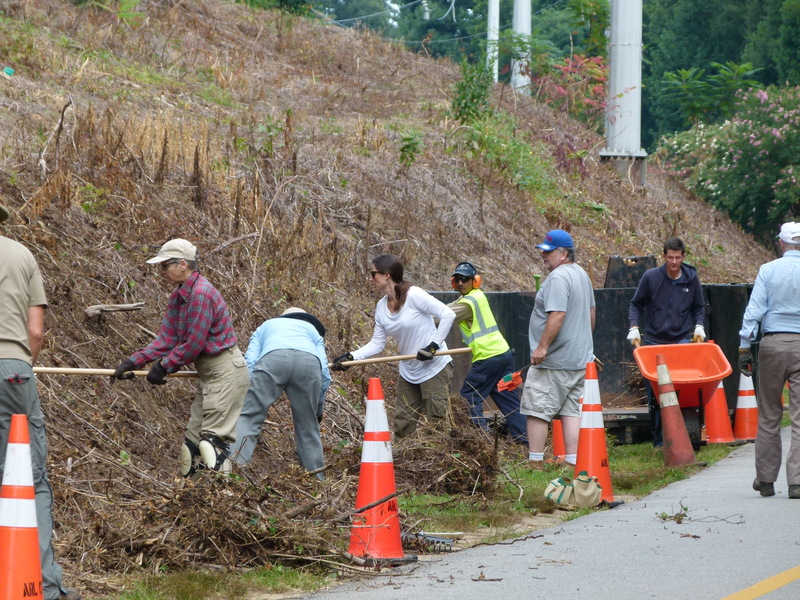 A determined and energetic group of allies put their hearts, souls, and backs into transforming a tangled, rocky slope into a smooth bed ready for native plants on Saturday August 17th. Their combined efforts transformed a large embankment alongside the W&OD Trail in Arlington where it runs past Bon Air Park. Project coordinator Patrick Wegeng, the Environmental Landscape Manager for Arlington County Parks and Natural Resources Division, had put out a call for help to the Master Gardeners of Northern Virginia, Tree Stewards, Remove Invasive Plants (RIP), Virginia Native Plant Society, and Arlington Master Naturalists, who responded in force, and with gusto! Patrick and his crew had already removed invasives and re-planted the ornamental garden on the opposite side of the Trail, where Boy Scouts and a large corporation had lent their hands in order to protect the riparian buffer of Four Mile Run Stream at that site. But the new planting was threatened by a constant influx of invasive seeds from the embankment nearby. This part of the trail is right off Wilson Boulevard, where it gets a lot of public traffic. People noticed the improvements that were made and had shown a lot of interest in the project, so completing both sides of the trail seemed like a good use of time and funds. The Park and Natural Resources crew prepared the site by cutting down 20 foot high invasive Japanese honeysuckle and porcelain berry plants while preserving the natives that had been marked. On Saturday our task was to clear the embankment of dead stems, branches, vines, and roots – many of which were still deeply embedded in the ground – as well as rocks and trash. Working on the steep slope was a real challenge! County landscape staff was on hand to help, and the county provided tools, equipment, and trucks as well. A system of ID, mark, rake, and remove was quickly established. As the piles of debris grew at the bottom of the slope, wheelbarrows were filled, pushed to the dumpsters and emptied. While the work went on, the volunteers made good use of the time multi-tasking by sharing information and networking. Who knows what future collaborations may be springing from ideas exchanged on that slope? By the end of the morning, two dumpsters were completely full, and the entire section had been cleared. A job well done! Patrick explained that the first planting will consist of annual and perennial rye grass in order to complete the eradication process. He said that if the eradication was sufficient, it was possible for the next phase to begin in October. His eyes sparkled as he described the bank’s new look: “drifts of native wildflowers and grasses; broom sedge, milkweed, little blue stem, black-eyed susans.” Instead of porcelain berry and honeysuckle. Thanks to all! In response to a request from the staff of Chesapeake Bay Foundation (CBF), ARMN members Melissa Perez and Kasha Helget got their feet (legs, and knees) wet on Friday, May 10th to assist in the reconstruction of a celery grass enclosure on the Potomac River’s Belmont Bay at Mason Neck Park in Lorton. Perez is a grass grower and Helget is a regional coordinator in CBF’s “Grasses for the Masses” program. In this program, Virginia residents grow underwater celery grass (Vallisneria americana) in their homes or schools during winter, and then plant the grasses during spring in Belmont Bay at Mason Neck Park or in James River. The aquatic grasses filter nutrients and provide important habitat for fish and other aquatic creatures, and help restore the health of the Chesapeake Bay. The grass plantings take place on several days between mid-May and early June; however, CBF staff was notified that the enclosure at Belmont Bay was destroyed by some errant driftwood and needed to be rebuilt before the grass installations could be done there. So, a group of seven CBF staffers and volunteers jumped (waded) in to replace screening around the enclosure and anchor it to the sand for better support, and to prevent turtles and other large interlopers from entering the enclosure and destroying the grasses. Master Naturalist Melissa Perez holds up a support post while awaiting additional cable ties for the screen. In the past month, seven local properties have joined the ranks of homeowners creating a green network for wildlife in Arlington and Alexandria. This critical work is intended to blunt the impact of habitat loss in our area by providing small sanctuaries desperately needed for the survival of wildlife in our increasingly urban environment. The properties range in size and style from a narrow lot in Old Town Alexandria to a wooded ravine and intermittent stream just above Chain Bridge. 1. Remove invasive exotic plants. 2. 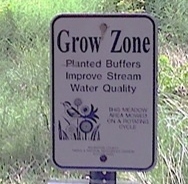 Reduce or eliminate pesticide and fertilizer use. 3. Conserve and protect water, waterways and water quality. 4. Install native plants to support the local food chain. 5. Support wildlife with water, cover and food to the extent possible. 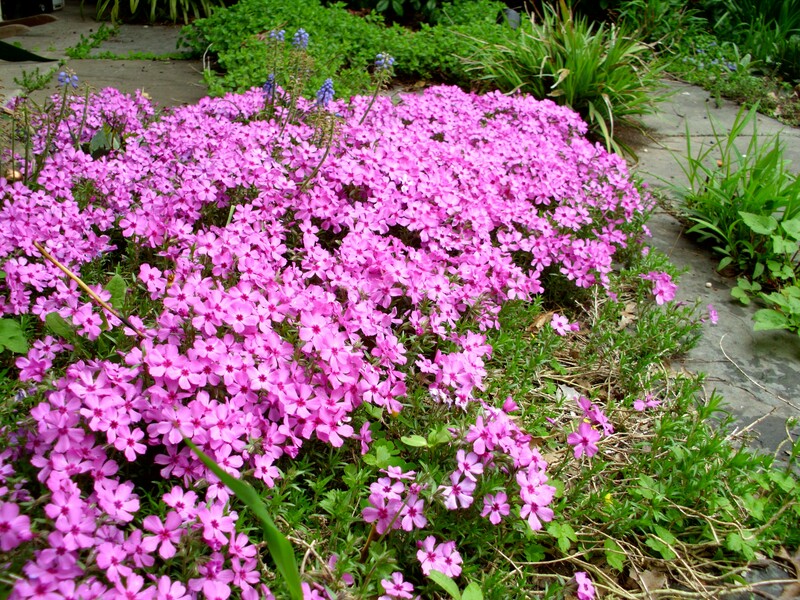 Moss Phlox (Phlox subulata) is a great evergreen groundcover for a hot sunny area, shown here on a south- facing slate patio. On March 16 a sturdy group of volunteers participated in the March Habitat Restoration of Tuckahoe Park.The volunteers warmed up in the cold, damp morning by pulling up English Ivy. Along with ARMN members, volunteers include young women from Arlington’s Career Center’s ROTC unit, Yorktown’s NHS, and Marymount University. Volunteers rescued 25 mature White Oak, Red Oak, and a young Beech tree from being strangled by English Ivy.